We tend to not put a lot of thought into the backpacks that we choose when we hike. It is often cheaper to look for something that is bigger to store everything even though it might not always be more durable. Solar backpacks will offer you much more than simply storage space and quality, but they will also allow you to keep all your devices fully charged. We have decided to find the best solar backpack, which is filled with quality and made from durable materials to give you a greater hiking experience. Much like any normal bag, the solar backpack is also great for storing all your hiking and climbing equipment. These bags might be a little heavier to make a place for the solar panels, but these will really come in handy when you need assistance or when the GPS runs flat. The solar bags will have the capabilities of fully charging your mobile devices while you are on the move. You’d think that all of the solar backpacks are the same and that you could simply just buy the biggest, cheapest one. Well, that is not the truth and the quality of the solar panels will have a huge impact. Having bad quality solar panels will only leave you with a few watts of energy at a time and you might not be capable of fully charging all of your devices. But that isn’t the only feature you should keep in mind. When we look at any backpack, the overall weight plays a huge part and having a bag that is too heavy will become a burden when you are enjoying your adventure. Yes, you will most likely stuff the bag until it is heavy, but it would be extremely beneficial to save some weight on the frame and materials of the bag to keep you from getting fatigued. It is important to try on the bag and to make sure that you do not feel any abrasions when walking with it. Abrasions can possibly spoil the entire hiking experience and we believe that the right quality materials and extra padding are something that one really needs to take into account. A bigger battery might take longer to charge, but once it is fully charged, you will be able to charge more of your devices on the backpack. The battery size will also directly influence the weight and we believe that you will need to take the charging of mobile devices and the hiking distance into account before making this decision. Should the rain suddenly start pouring down, it will be helpful to have a waterproof backpack to keep everything on the inside dry and safe, especially the circuitry of your solar panels. It can really set you back in terms of time if you are unable to continue in a light rain storm and we recommend that outdoor hikers always look for a waterproof solar backpack. The main reason for buying a backpack is the interior space that it presents. It is important to make sure that the selected backpack is big enough to keep everything you need to carry along on your hiking trip. Many people also choose to have backpacks with built-in compartments, but this is all a case of personal preference. We only recommend something that is big enough and still lightweight. As you may have noticed, we did not take the price into account and the reason for this is simple. Buying a cheaper backpack might not be all that efficient in the long run and you might have troubles. The more expensive backpacks are made from strong and durable materials and you will definitely be able to get multi-functional use out of them for a longer period of time. Description: The VIVO solar bag is one of the most stylishly designed solar backpacks on the market. The backpack features an urban camo look that will be great for outdoor enthusiasts and even hunters will be able to use the bag as it is big enough to carry ammunition and the color will allow you to easily blend into the wild. The backpack features 7 adapters which will allow you to charge multiple devices and different devices at once and the 1600 maH battery is great for charging a few items. The solar panels are built in and they are the perfect size for charging GPS and mobile devices, but the battery might not be big enough to charge more than one mobile phone at a time. Furthermore, the backpack is also extremely lightweight compared to other solar backpacks and the strapping for your shoulders have been perfectly padded to ensure that no abrasions ever occur when using this backpack. The interior of the backpack is only 25 liters, but this will once again save you some of the weight and you will still be able to store a moderate amount of things on the inside. We highly recommend this bag for everyday use as well as outdoor use. Hunters will especially enjoy the lightweight frame and they will still have enough storage space for ammunition as well as the capabilities of charging the GPS once it decides to die. Overall, it is really affordable and great for multi-functional use as it will serve the needs of most outdoor enthusiasts. Description: The ECEEN hiking daypack is one of the most affordable backpacks on the market. The backpack is packed full of features and even though the 15-liter storage capacity might not seem like a lot, you will be able to have everything perfectly compartmentalized on the inside of the backpack. The added PVC coating has been designed to allow you to walk through any rugged terrain and you can be sure that thorns will not damage or tear the bag. The PVC coating is also great for keeping the water out and with the water resistant zippers, you will be able to walk through any weather storm without having your mobile devices getting water damage. The charging capabilities are quite average and with a 200maH battery, you should be able to charge at least your mobile phone or GPS unit. 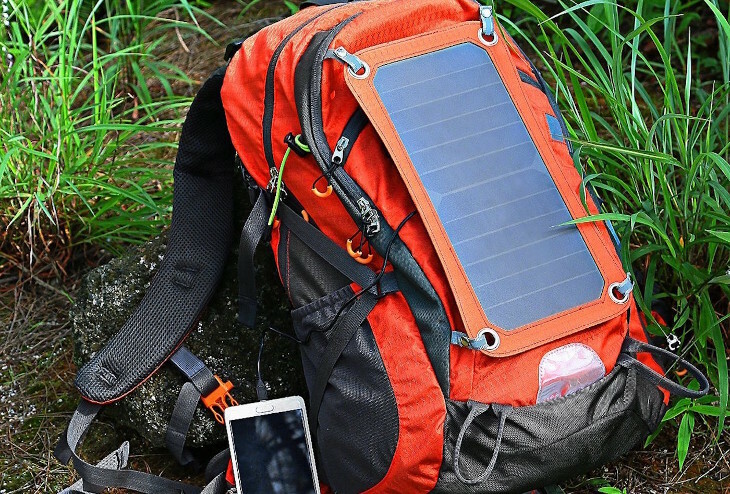 The solar panel will take a while to charge, but because it is extremely lightweight and compact, it should not be an issue to carry around the bag. 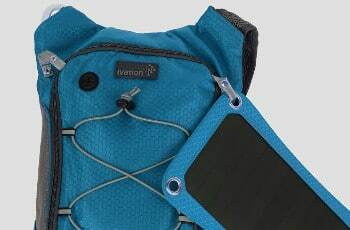 Furthermore, you will be able to reduce the weight of the backpack when you are using it for everyday use and the solar panels can easily be removed. Even though the bag is already quite light, it could be used as a great gym bag when you remove the solar panels and the water resistant material will ensure that no sweat comes inside. Description: The EnerPlex Packr Commuter Solar Powered Backpack is the perfect addition to a business man that is constantly on the move. The batteries are strong enough to charge your mobile phone or to keep the laptop charged when you are on the go. You will only need to find the correct adapter. The 2 internal zipper pockets will be great for storing water bottles if you decide to try the outdoors and in the main compartment you will find a perfectly designed laptop sleeve that will keep the laptop safe when on the move. The entire bag has also been padded and you can be sure that no abrasions will occur when you are carrying the bag. This is because of the added padding in the adjustable shoulder straps. The solar panel is built into the backpack, but because it is relatively small, there will never come a time where you’ll decide to remove it. Unfortunately, the solar backpack will not be great for longer hikes, but is a great choice for shorter hikes or walks around the park. You will also be able to use the backpack for everyday used and the quality will never let you down. The backpack comes in a stylish black color which should be great for business men and the backpack also looks stylish. We highly recommend this backpack for business travelers or the odd hiker that likes to carry the laptop along. 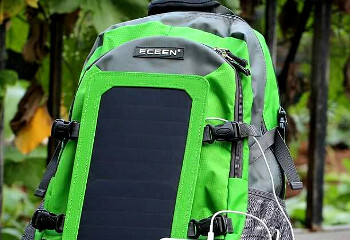 Description: If you like to go for longer hiking trips, this ECEEN solar backpack will be a perfect. The backpack is extremely spacious and will provide you with a lot of extra storage space. The overall capacity of the bag is a staggering 42 liters and users will be able to compartmentalize everything on the inside with the already built-in storage compartments. The battery in the backpack is extremely large and it will offer 1000maH of storage. This will be enough to fully charge multiple media devices and to ensure that none of your devices ever die out. The backpack also features 7 solar panels and they have been incorporated in such a way that it does not drastically influence the overall weight of the bag, so you can avoid fatigue. The overall fabric used in the construction of the bag is water-resistant and this will allow users to safely hike in the rain instead of wasting time, waiting for the weather to improve. The solar panels can also easily be removed to decrease the weight if you need to use the bag in the city. The over multi-functionality of the bag is huge as you will be able to use it in multiple outdoor areas. If you manage to find some sun while on your hiking trip, this bag will be perfect for use. We highly recommend this ECEEN bag and we believe that users will be able to get a lot of use out of it for a really affordable price. The bag has been specifically designed for outdoor enthusiasts to enjoy the outdoors and to have a more comfortable hiking experience. Description: The Ivation 7W Solar Charging 1.8L hydration backpack will be perfect for hiking enthusiasts that love to take on those longer routes. You will be able to stay hydrated with the 1.8-liter bladder bag, but this will add some weight to the backpack at first. The weight will slowly die down as you walk and deplete the water level. However, having a steady supply of water with you is better than becoming dehydrated and separated from any source of clean drinking water. The backpack also features a huge 10000maH battery that will allow you to fully charge up to 4 different devices at the same time. The battery only takes a few hours to fully charge and with the newer model cell phones, you will be able to stay outdoors for multiple days and still have fully charged mobile devices every day. The backpack is very lightweight and compact and even though it does not have a huge storage compartment, the bag will still be perfect for keeping everything that an average person will need on a medium hiking trip. The bag is also very affordable and we believe that it will provide a lot of multi-functional use to some of the outdoor enthusiasts. Finally, the entire bag is water resistant and even the solar panels have been coated with a layer of anti-scratch plastic. This will allow you to walk through more rugged terrains with peace of mind that your bag will never damage. 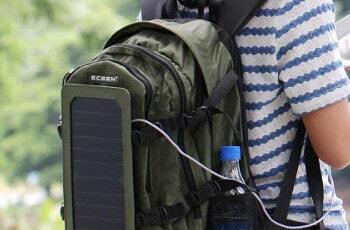 Description: The SolarGoPack solar powered backpack is the backpack with the largest battery on the list. The backpack features a huge 12000maH battery that will charge multiple media and mobile devices in no time and the solar panel will charge the battery in less than 1 day. This means that you will be able to fully charge all of your media devices every day. The backpack is also significantly heavier than most of its competitors, but this weight can easily be trimmed off if you only use the backpack in the city. You will be able to easily remove the solar panels and this will significantly reduce the weight, which will in return reduce the speed at which fatigue sets in. The best feature on the entire bag aside from the huge battery is the storage space. Even though the manufacturers have included a larger battery, the inner capacity is still significantly large and you will be able to easily compartmentalize all of your outdoor equipment. You will also be able to add a bladder bag to the backpack and this will ensure that you stay hydrated throughout the hiking experience. We highly recommend this bag for who that plan on taking longer trips and we believe that the battery and powerful solar panels will ensure that all of your media devices are fully charged and ready to use. The bag is a little more expensive, but this will definitely even itself out over the multiple years of usage that you will have with it. 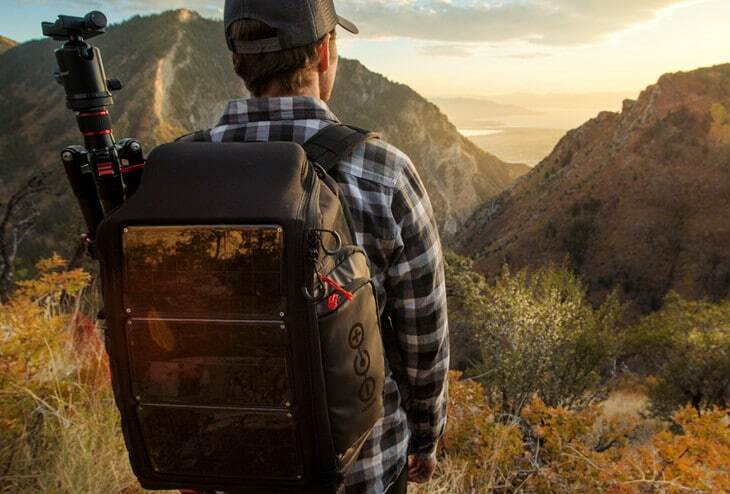 Should you have the opportunity to invest in a solar backpack, why would anyone want to settle for a normal backpack? These backpacks will certainly make life easier and ensure that you are never left without technology to guide you once you get lost. We would like to thank you for reading this article and we hope that you now understand some of the advantages that are provided by these solar backpacks. We would like to encourage to let us know about your experiences with these backpacks and if you like any other solar backpacks that we missed.